Today is day 4 of Inktober, and the prompt is "spell". My inspiration for today's magical nail art is a ouija board. The all powerful, super supernatural game board that summons...things. Ouija boards have letters on them, and after doing some ritual chanting (I assume), you can "speak" to spirits, who respond to you via the board, spelling out words or names as responses. 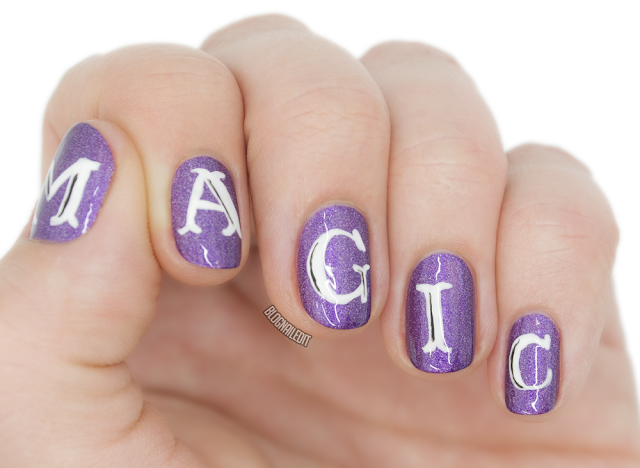 So I summoned some inspiration from the board, and wrote the word "magic" on my nails in the font style of the board. That mystical purple is China Glaze Virtual Violet, while the white is Purity (Zoya) and the black is Licorice (essie). Unfortunately, all the magic in the world wouldn't allow me to bend my thumb to make the picture better. Enjoy more Inktober with me tomorrow!